I have a childish sweet tooth for medieval tales, of castles besotted with knights and magical creatures, so it comes as no surprise I would pick up the post-Arthurian story The Buried Giant, by Kazuo Ishiguro. 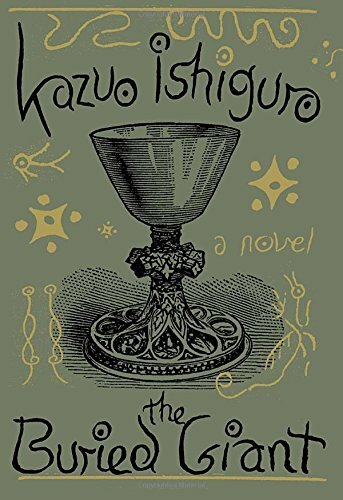 The Buried Giant, Kazuo Ishiguro’s seventh novel, leads the reader on the journey of protagonist couple, elderly Axl and Beatrice, as they travel, searching for their son, through the mist, which saps almost all past memory that blankets the land of England. Axl and Beatrice encounter conflicts, both literal and figurative, along the trail: the Saxon warrior Wistan and his foil, nephew to King Arthur, Sir Gawain; a pious sect of monks rumored to know the secret behind the mist; a dragon that is coveted and hunted by many and finally, a tension between Saxons and Britons for reasons buried behind the misty veil. Ishiguro’s writing style intrigues me; he speaks across the pages in simplistic fashion, “For warmth and protection, the villagers lived in shelters,” and it is this manner that makes his story easy to follow by even a child, however, it does not stop at the level of narration. What reader of fantasy is not drawn to the clash of arms between warrior valor and despised monster or the long-awaited triumph of love over all obstacles? Ishiguro sends all these desired elements to the background. Why does he take the succinct morsels of any fantasy and render them as mundane as greens on a dinner plate? Perhaps Ishiguro is drawing our attention away from that cliché, like a chef offering a new dish instead of the old with a twist. As it is, for a new attempt to be flawless is a rare occurrence. Ishiguro struggles with his ingredients. For much of the novel, Ishiguro conceals the identity of the narrator, “I have no wish to give the impression that this was all there was to the Britain of those days,” and within different portions of the story Ishiguro switches between third and first person, here taking the role of Sir Gawain or a humble boatman, a choice that left me confused at times. His plot also suffers a crisis part way into the novel. Similar to Axl and Beatrice forgetting “how talk of this journey had started, or what it had ever meant to them,” Ishiguro has forgotten where his adventure started out only to end up deep into the woods fighting mythical creatures, escaping a monastery of monks and following an old, senile knight all while trying to find the path forward. Ishiguro might not be the King Arthur of the kitchen, but I still found his novel The Buried Giant fun to read. Following Axl and Beatrice brought back memories of times spent with my own grandparents; moments when Beatrice’s chides Axl, ““Stop that, Axl” Beatrice whispered. “They won’t thank you for singing lullabies to them,”” or hearing Axl, with grandfatherly pride, exclaim, “No one’s ever said I’m slow in my work, princess.” Ishiguro’s other characters give me a nostalgic memory of past movies and stories within the comedic moments of Sir Gawain, “I’m a knight and a Briton too. Armed, it’s true, but come closer and you’ll see I’m just a whiskery old fool,” or the image of Axl and Beatrice floating downstream in a pair of wicker baskets. I chose to simply savor the dish Ishiguro served for the new form he offered in lieu of repeated plots. If by chance you find yourself holding a copy of The Buried Giant, I prompt you to give it a read. Ishiguro attempts to strike a different flavor of fantasy storytelling and while not the five-star entrée, it has its own je ne sais quoi. Perhaps you too will discover a precious memory shrouded within the mists. About the Author: Kazuo Ishiguro was born in Nagasaki, Japan, in 1954 and came to Britain at the age of five. He is the author of six novels: A Pale View of Hills (1982, Winifred Holtby Prize), An Artist of the Floating World (1986, Whitbread Book of the Year Award, Premio Scanno, shortlisted for the Booker Prize), The Remains of the Day (1989, winner of the Booker Prize), The Unconsoled (1995, winner of the Cheltenham Prize), When We Were Orphans (2000, shortlisted for the Booker Prize) and Never Let Me Go (2005, Corine Internationaler Buchpreis, Serono Literary Prize, Casino de Santiago European Novel Award, shortlisted for the Man Booker Prize). Nocturnes (2009), a collection of stories, was awarded the Giuseppe Tomasi di Lampedusa International Literary Prize. About the Author of this Post: Mark Edwards is a transfer student to North Central College in his junior year pursuing a degree in English Studies. Prior studies at Waubonsee Community College were in theatre, which fueled his passion for film and acting. Mark, born and raised in Illinois, spent his summer of 2015 living in Los Angeles and plans to return after graduation at NCC in hopes of getting far, far away from winter.